The farms around TSOP are known to deliver fresh homegrown produce to local restaurants in the area. These farms are associated with CSA so you get to know the farmers, their land, and their crops. There is this side of me that longs to be an expert organic, green thumb guru tilling the raised beds expecting a harvest. I know it is not as easy as it looks, especially at This Side of Paris where the climate does not allow for a long growing season. Growing up in the South in early spring, I remember my dad, would till the ground in preparation for the vegetable garden. He knew exactly what he wanted to plant. My siblings and I, on the other hand knew what would become of it — a playground for us to meander through the tunnel of green beans and bitter cucumbers. The “Big Boy” tomatoes were often picked before they could show off their size as part of the produce market game my brother and sister enjoyed playing. We know we plan to enjoy cooking locally grown produce brought to us by our local farmers in the area. Much of their produce is sourced by local restaurants. However, if we decide to take a break from our ground work, we love supporting our local restaurants that source through local farmers. Against the Grain is a certified biodynamic and organic produce grower not far from TSOP. Their modern approach to farming is helping their company expand their business to meet the demands for cleaner food consumption. They partner with one of our favorite restaurants in town. F.A.R.M cafe is a non-profit restaurant on W. King Street. It has a unique concept of dishing out high quality and delicious meals for lunch regardless of means. They stand by their motto, “pay what you can” and get a quality meal that is farm to table from local farmers in town. North Fork Farms is another small family farm serving pasture-raised high quality meat products without added hormones or antibiotics. They are a known meat provider to several local restaurants in the area such as Proper Restaurant— Boone’s local proper southern diner with all the fixins’. For now, we are busy cultivating the flower beds for a bountiful perennial showcase of colors come middle of June. Finding the right plants to grow is half the battle. Thankfully, the soil at TSOP is extraordinary rich. We are borrowing gardening concepts from Paul Gautschi, founder of Back to Eden Gardening. The earth’s natural process of mulching the ground leaves for a very dark soil, rich in nutrients. 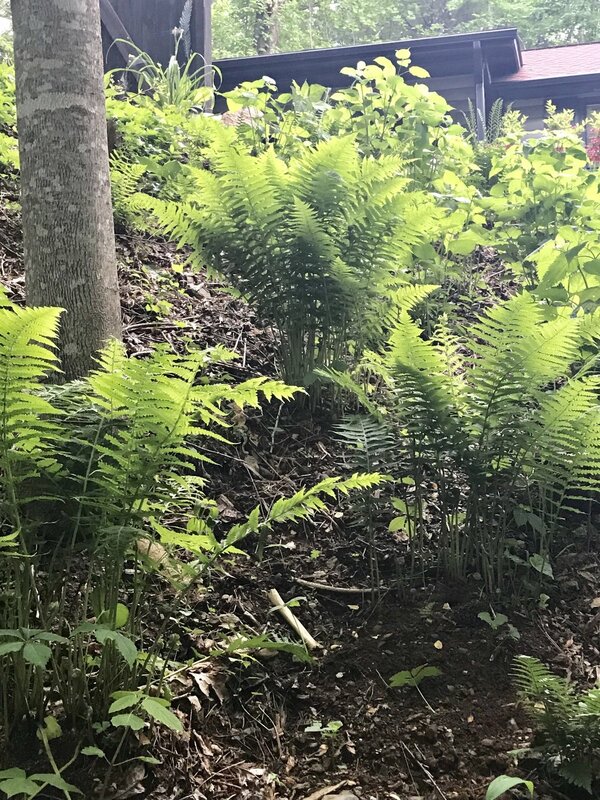 This black gold makes the variety of ferns, hostas, wild irises, wild lilies, roses, and hydrangeas on the property to thrive. The property is a natural nursery for Cinnamon ferns, Ostrich ferns, Royal ferns, and Licorice ferns. Finding these all around the property, we have gathered enough variety for replanting in our redesigned garden beds. Along with the flowering plants, the variety of hostas, and the “Endless Bloom” hydrangeas propagated from our original plant back home will bring in the splash of colors and a source of flower cuttings all summer long. We have also added large colorful terra-cotta pots around the gardens for added interest and an all year round pop of color. 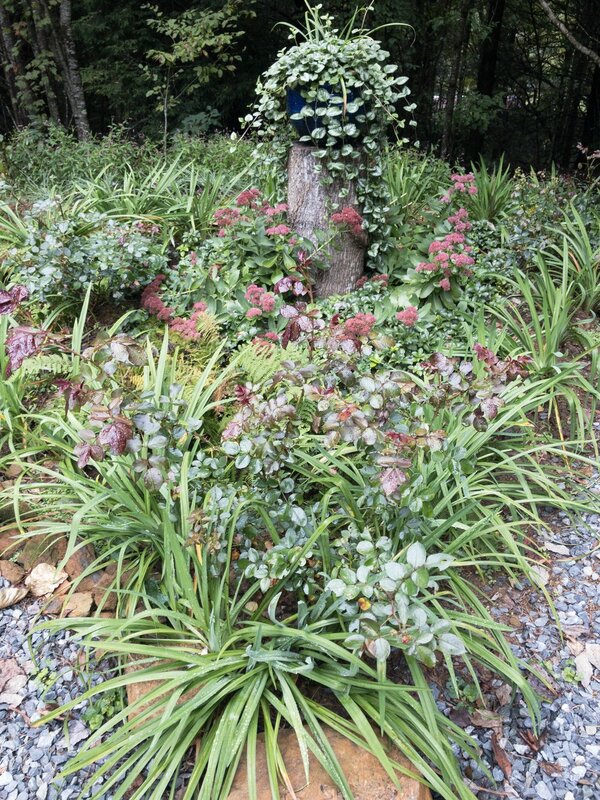 Most of what have planted at TSOP are perennials. With the warmer temperatures lately, I get excited to see little buds starting to pop up from the ground - weeds included. I discovered that pure vinegar works just as well to weeds as Roundup without the harsh chemicals, plus it is a fraction of the cost. 1. 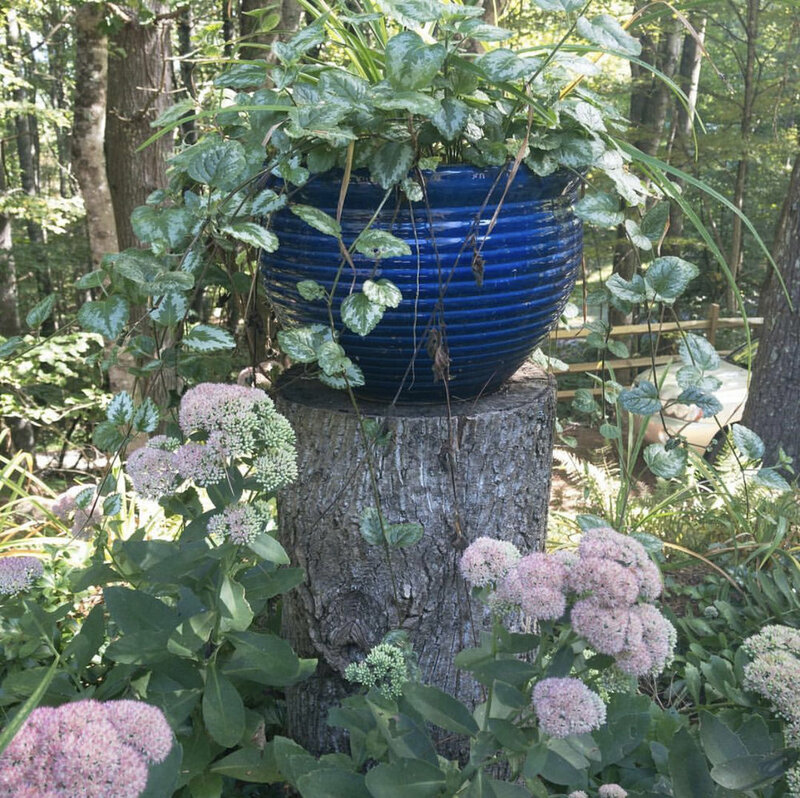 Terracotta pots in blue and white 2. David bust planter 3. Gardening stool 4. All in one bulb planter 5. All weather boots 6. Toile rain boots. 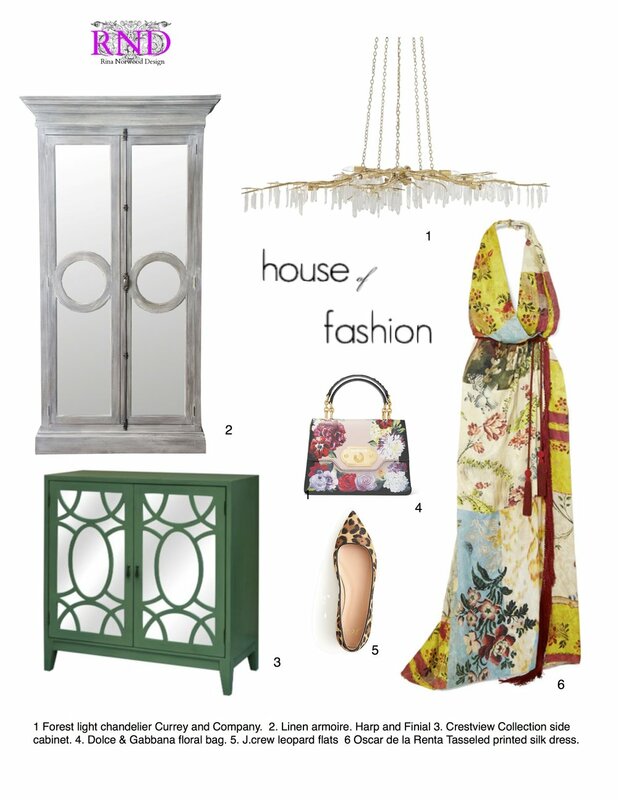 Our House of Fashion board has my best pick for garden essentials. Blue and white remains a forever classic color scheme for both indoor and outdoor decor. You must really see the colorful pots and gardens at TSOP. Our Airbnb, “Go on a Wine Tour at This Side of Paris” listing gets plenty of views, so don’t waste “thyme” but plan to come see us on the mountain side. No matter what the weather brings, This Side of Paris is always a good idea. This winter brought a mixed precipitation of rain and snow - rain mostly. The peace and beauty around this side of the world keeps us coming back with more inspiration for content worth sharing. We continue to make changes on our “reno” list. Construction projects around the house have to be carefully selected. With the winter season still lingering, we are focused on the interior aesthetic. The fifty shades of brown will all need to be fifty shades of modern cabin glam. We are truly inspired by how well the kitchen renovation turned out. You can see the “before” and “after” photos here. Now that the new roof is completed and the construction mess is out of sight, I am ready to bring a fresh new modern blend of Parisian-Americana style. 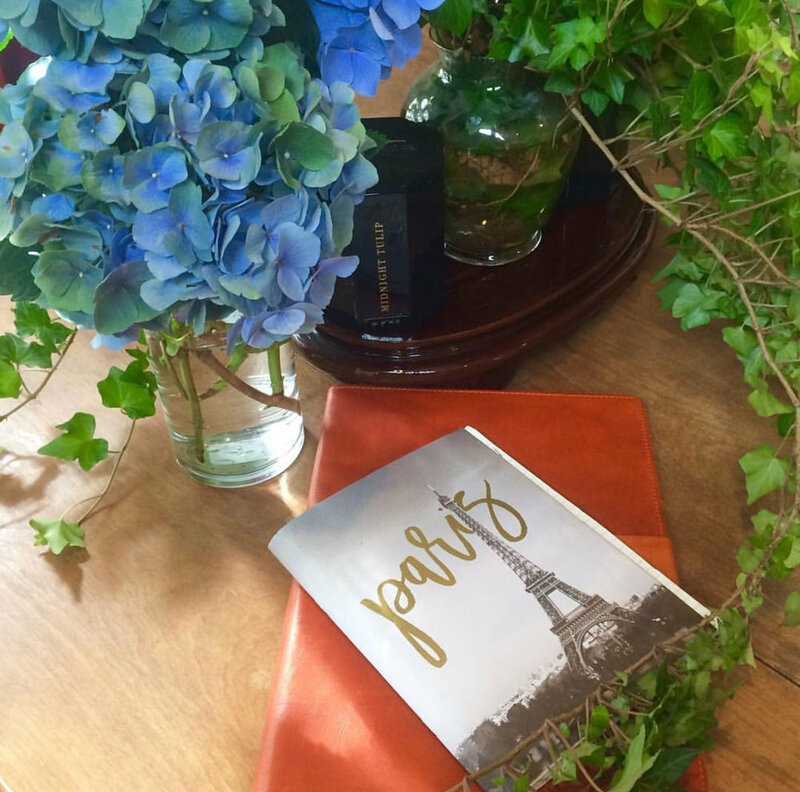 I am incorporating traditional Parisian colors along with the elements found in nature that surround this property. Designing a 900 square foot cabin requires strategic space planning so that gatherings at TSOP are comfortable and stylish. The careful selection of furnishings is key to putting just the right furniture piece in its right location for functionality and beauty. Details in construction, such as form and scale are design elements necessary in creating a cozy gathering space suitable for hosting travelers at This Side of Paris. I can’t wait to share the finished design with you soon. Here are my three helpful design tips in selecting living room furniture pieces with limited space and storage. Case goods with ample storage space that can serve as a wardrobe or linen closet. 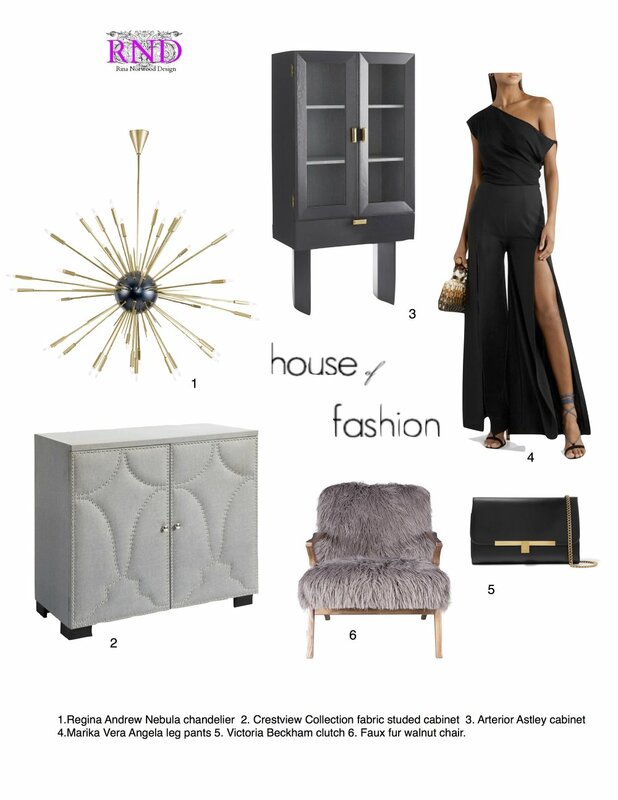 Along with my three helpful design tips, I picked a few must-haves for our House of Fashion board to help keep you in reno-style. 1. Comfy and stylish. This RND tank is a balance between style and comfort. 2. Sorel waterproof boots will keep your toes sawdust free and comfy. 3. Wood’s up T-shirt will keep you rocking a style for that “measure twice cut once” construction motto. 4.The Bosch Max FlexiClick 5-in-1 Drill/Driver System has one tool and five attachments. Maximize your workforce in this easy 5-in-1 drill boss. The Bosch 5-in-1 Drill Driver System is available online and in home centers. 5. This pocket portable tool is a throw-in-your-bag handy-dandy essential tool set that will tackle most of the easy fix-it projects around the house. 6. Hardworking hands need a hardworking hand softener. Working Hands is scent-less and grease-less. 7. It’s an inflatable shim sold by Calculated industries. DIY’s Johnny on the spot handy-dandy Air Shim is great when working solo. 8. 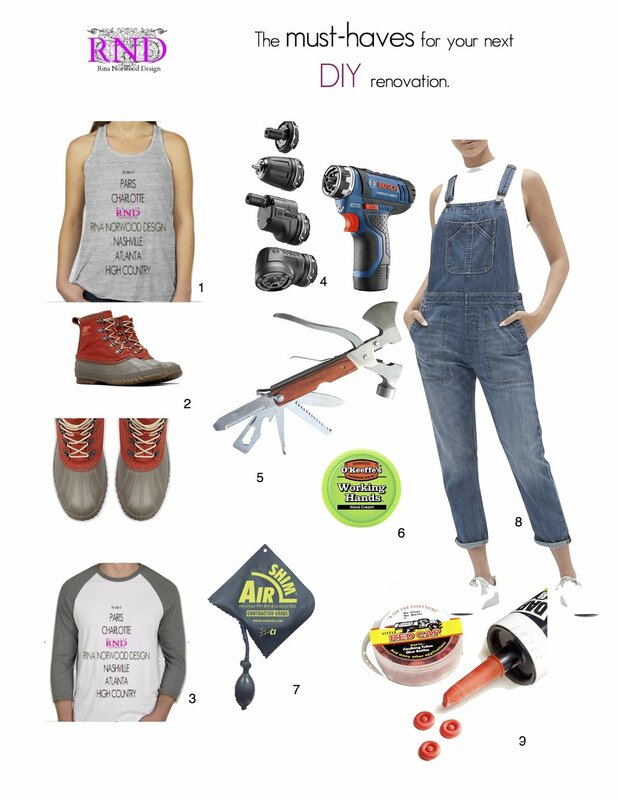 This denim overall is not made just for hard labor. It is hard at work keeping you styled at any task. 9. Need I say more? The Red Cap are covers for any caulking tube. These Little Red Nozzle Caps are just the right fit. Cap, seal, and save dollars! With every visit to TSOP, I find a new local hangout to grab a quick snack or a bite to eat. The interesting conversations exchanged among patrons and business owners are perhaps the most magical things about the High Country. The willingness of business owners to open up to the community and share their gifts and talents plays an important role in making this area around TSOP vibrant and interesting. Our friends down at the local Jerky Outpost deliver a variety of artisan jerkies from your usual beef to exotic meats. The flavoring also comes in a variety of mouth watering heat intensities. If you can’t get enough of it, they offer monthly Jerky membership to keep your pantry stocked with their flavor of the month. These last few weeks have been filled with cultivating new ideas on our end. Of course, we could not have made it through without a little help from our new friends at The Local, an eclectic eatery in Boone, NC. They were the pièce de résistance in delectable eats and fresh flavors. Plus, they know how to keep the joie de vie atmosphere with live music, crafty cocktails, and draft microbrews. This vibrant, American hangout was just what my crew and I needed to reawaken our creative flow and ease our hunger. There were many days in the renovation schedule that required 16-hour days. We did not mind it one bit, as we have managed to fill the fridge with homegrown food goodness from the Watauga Farmers Market. Happening every Saturday in May through October from 8am-noon, this downtown spot is a sure bet for local honey, veggies, and much more. We have found that the vivacious colors painted across each natural element of This Side of Paris creates the perfect picnic backdrop, so picnic meals on the property are really a treat. So far, 2019 has been a year of cultivation; and although our agenda has been filled to the brim, the Holy Spirit seems to prioritize and require of us to just be still and take note of the reminder of what we are here to do. De-cluttering is a continuous process, which manifests the cultivation we are seeking here at This Side of Paris. We have been letting go of those things that no longer serve us or bring us joy. More importantly, we are learning to hold tight and to not only appreciate the things that still brings us joy but also to share those things with others and to not keep them to ourselves, despite their useful purpose in our own lives. We are beginning to understand that sometimes the greatest purpose in something can be discovered from sharing it with others. So wherever this year continues to take you, be it an adventure on the fiscal side of local business or the physical side of organic nature, make sure you are on This Side of Paris to create those precious moments in life that remind us to be still and smile about what life has to offer — those moments that inspire us to truly live. Regardless of what your recipe for success requires, make sure you are ordering your ingredients off the Menu of Travel.